Filmmaker Josh Fox brought attention to the environmental risks of the method of natural gas extraction known as fracking in his 2010 documentary “Gasland.” He’s back with a sequel warning of even more profound dangers. Steve Everley Spokesman for Energy in Depth, a research and education program of the Independent Petroleum Association of America. Josh Fox Founder and producing artistic director of the International WOW Company and writer/director/producer of three feature films, including "Gasland." Abrahm Lustgarten Reporter at ProPublica. MS. DIANE REHMThanks for joining us. I'm Diane Rehm. 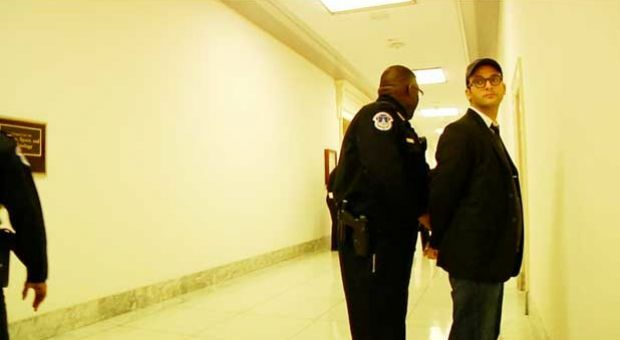 In 2010, Josh Fox released his first documentary on fracking. "Gasland" showed widespread water contamination, air pollution and health hazards associated with the practice of injecting water and chemicals deep underground to fracture rock formations which then release natural gas. But the oil and gas industry argues the process is safe. MS. DIANE REHMAnd President Obama has made natural gas a cornerstone of his energy policy. In a sequel now airing on HBO, Fox says the stakes have been raised on all sides with democracy itself now at risk. He joins me in the studio to talk about "Gasland Part II." You'll hear other perspectives during the hour, and I'd certainly like to hear yours. So do call us, 800-433-8850, send us your email to drshow@wamu.org, follow us on Facebook or Twitter. Good morning, Josh. It's good to meet you. MR. JOSH FOXGood morning. Thanks for having me. REHMAbsolutely. And before we begin, I do want to make clear to our listeners that my husband and I do own property in the Marcellus Shale in the northeast tip of Pennsylvania. And that's why you got into this whole issue of fracking. FOXThat's right. I'm very close. I'm in -- also in the northeast tip of Pennsylvania, about a mile from New York border. In 2008, my father received a letter asking to lease the land for natural gas drilling. And before that, I knew nothing about fracking. I knew nothing about natural gas. I was not interested in issues of energy. FOXI was actually going door to door in the Pennsylvania primary at the time campaigning for Barack Obama. And when this came to us, it -- my dad looked at this letter and said, figure this out. This looks like a scam, you know. And I looked at it, and I said, I think this is for real. REHMBecause they offered you $100,000. FOXYeah. It was an offer that was for our 19 1/2 acres, a dollar amount that got to near $100,000. And that was just for the initial lease signing. There was the promise of royalties after that. And as I found out, this was not just happening in my town or my area or the Delaware River basin. This was happening across Pennsylvania, across New York State. The Marcellus Shale is 65 percent of Pennsylvania, half of New York, half of Ohio, all of West Virginia, parts of Maryland and Virginia, going all the way down to Tennessee. FOXAnd then I discovered that these shale plays, these shale formations which contain natural gas frozen stuck inside of the rock, in the fractures in the rock, were all over the United States and that this hydraulic fracturing or fracking, also something I had never heard of at that moment, was going on in 34 states, that it involved injecting huge amounts of water, two to 9 million gallons of water infused with these host of toxic chemicals that we call fracking fluids, and that they inject it at such pressure, broke apart rock and freed up gas, and that we were in the middle of the largest natural gas drilling -- domestic drilling campaign at that point in history. REHMSo you created "Gasland I," but now, why "Gasland II"? FOX...just sort of educating people because the gas industry comes in, and they say, oh, everything is going to be fine. It's just a fire hydrant in the middle of your field. You'll never know we're here. It's perfectly safe. FOXAt the same time, I had been hearing reports and saw across the country, as I made "Gasland I" people who could light their water on fire, widespread water contamination, gas migrating out of the formation into aquifers, massive land scarring, air pollution problems, a health crisis, fragmentation of communities. And as you know, back at that time, it was millions of people getting that knock at the door all across America. FOXRight. And the issue exploded in the media in 2010 when -- that's when the film came out, but there were also so many other reports. And as we were going forward, realized that, you know, we were in the middle of one of the most controversial issues in the United States today. Fracking was practically a household word. FOXWhy wasn't the government doing anything to stand up for Americans whose human rights were being violated, who were being harmed by multinational oil companies drilling all over the country? This is the thing that didn't make sense to me. How was it that no one in the government that I could see with any authority, governors or the president, was taking this on and telling the story the way I was hearing it from people across the country? REHMTo what extent is fracking regulated under the Safe Drinking Water and Clean Air Act? FOXWell, in 2005, the Bush-Cheney government put out the 2005 Energy Policy Act. It was passed by Congress and signed by George Bush that had an explicit exception for hydraulic fracturing to the Safe Drinking Water Act. FOXIt's come to be known as the Halliburton loophole. The Safe Drinking Water Act states, if you're going to inject toxic material into the ground, you have to get a permit from EPA, and you have to have a chain of liability. They're exempt explicitly. It's one page out of 1,000-page bill. Some people knew what they were signing. Others did not. FOXAnd what that means is, except for in the case of where they're injecting diesel -- that's still illegal -- all these fracking chemicals of which we know up to 900 of them, Theo Colborn, the brilliant chemist, has tracked a lot of these chemicals. And you can find those chemicals on her website, TEDX.org. These chemicals are carcinogens, neurotoxins. They have very extreme health effects, even in small doses. And they're getting into water supplies, and they're being vaporized and going into the air on the well sites. REHMIt's interesting, but you say the gas drilling industry has now adopted the tobacco industry playbook. How so? FOXWell, when we put out the film and when a lot of reporting was coming out, the gas industry just attacked the credibility of the film, attacked the credibility of the families coming forward. They went to universities to create sort of bogus science that would challenge the findings of reporters. They've spent hundreds of millions of dollars on ads. They bought my name on Google. If you search for my name or the name of the film, it comes up with a misinformation video about my film as the first sponsored link. FOXSo this is the strategy that was used by the tobacco industry for decades. They create misinformation and doubt, so the idea is to create a perception that there's some kind of scientific debate going on because if there's a debate over the "facts," in quotes, that, you know, it stops action from occurring as an argument for staving off regulation. Oh, we don't have the information in yet. FOXWell, as it turns out, this strategy is well documented. It was created by a PR firm called Hill & Knowlton, and it's easy to -- there's a great book about it, which is also featured in the film, called "The Merchants of Doubt." And the -- America's Natural Gas Alliance hired Hill & Knowlton in 2009 as a PR firm for the gas industry to promote gas. And if you go out and if you turn on the TV, you will or even in some NPR stations, you're going to find an ad for the natural gas industry. FOXThey won't mention fracking. They'll say very sweet things like, you know, energy independence and all these kinds of things. What is this about? It's a proposal to drill one to 2 million new wells across the United States, which is a difficult proposition. It takes a lot of PR to put those kinds of wheels into motion. REHMYou now have the president of the United States saying that national gas development is part of his overall energy strategy. FOXWell, when we started making "Gasland II," Lisa Jackson who was then the head of EPA was actually quite aggressive in terms of investigating all the things that were going on with gas drilling, all the contamination reports. And there was a two-year EPA study. There were various investigations, one in Wyoming, one in Pennsylvania, one in Texas. And we chart those in the film. FOXBut then in 2012, the State of the Union address, which is pretty much the first campaign speech of the cycle of the election year, the president rolls out all these natural gas industry talking points in his speech, a lot of which are inflated jobs numbers, inflated projections for how much gas there are -- there is. And at that moment, we see everything change. We see two of the marquee investigations just disappear, fold, get dropped. FOXA citizen is standing there completely confused, not knowing what's happening. And you see this policy start to determine the action of the EPA, when what I thought was supposed to happen was that the EPA was doing science and that the scientific results would come back and determine the policy. This was the opposite. FOXWe know that the president -- and this is the president I mentioned I was campaigning for and still support in many, many ways -- has met many times with the natural gas industry. We know their administration has met many, many times with the natural gas industry. And I think that that's created a skewed picture of what this development means for that policy. FOXWe're asking him informally. Emails went out yesterday that I wrote letters and also in the media to please sit down and meet with the families in "Gasland II" who are emblematic of thousands of people who are suffering at the hands of these drilling campaign and to please meet with the scientists and engineers in the film who are going to tell him about the dark side of fracking, the side of fracking that the gas industry would rather not speak about. REHMYou know, we're going to hear from a spokesperson for the industry in just a moment. But you talked with people who had indeed sold the mineral rights to their land and ultimately found they could no longer live on that property. Short break here. And when we come back, we'll hear from a spokesman for the energy industry. Stay with us. REHMAnd welcome back. Here in the studio with me is Josh Fox. He created "Gasland," and now on HBO, "Gasland II," which appeared on HBO last night and will be appearing throughout the week. Joining us now by phone is the spokesman for an organization called Energy in Depth, Steve Everley. Good morning, Steve. Thanks for joining us. MR. STEVE EVERLEYHi, Diane. Good to be here. REHMPlease explain what Energy in Depth is. EVERLEYEnergy in Depth is a research and public education program of the Independent Petroleum Association of America. As you had kind of alluded to, you know, some people say it's an industry group. But, you know, we're open about that. It's an IPAA program, and we've been around for about three or four years now. REHMOK. And in a recent blog post, you called "Gasland" a fraud. Give us an example of what you call blatant and deliberate deception. EVERLEYWell, the iconic scenes in both "Gasland" and "Gasland Part II" have been disputed directly by state officials whose job it is to investigate oil and gas wells. The flaming faucet in "Gasland" that we all know about, Colorado regulators investigated it and said it was not due to oil and gas activity. In Texas, the flaming hose, that's the iconic scene in "Gasland Part II." EVERLEYThe Texas Railroad Commission, which regulates oil and gas in the state, said gas wells in that area did not contribute to ground water pollution. And so when we see these videos and we see these sorts of, you know, iconic images in these movies, we're supposed to believe based on the context that it's from hydraulic fracturing, that it's due to the industry. But when regulators actually determine the complete opposite, who are we to trust? REHMOK. I think that's a good question. Josh Fox? FOXWell, Steve, you know that the things that you're saying are either not true completely or half-truths. And I will correct what your -- your full disclosure. Energy in Depth was founded with contributions from Shell, Chevron, BP, Halliburton and the super majors with the explicit purpose of creating PR to promote fracking and serves as a kind of attack agency for all the families that I've worked with in "Gasland" and also on the film. FOXIn the cases that you mentioned, the gas industry has gone out many times and said, oh, well, it's naturally occurring methane. Well, we know from industries on publications, and these are featured in "Gasland II," that the wells fail and that the wells can liberate all different kinds of gas, both thermogenic gas, which is the gas that they are drilling for, and the biogenic gas, which can be closer to the surface in quite large pockets. FOXWhat Colorado Oil and Gas Conservation came in and said was there were two families featured quite prominently in the "Gasland I," one of which had thermogenic gas, and COGCC said, yes, that is oil and gas drilling contamination. That is the direct response -- responsibility and fault of the industry. The other family, they said it was biogenic gas. However, this is a distinction, which doesn't hold up to what the citizens themselves are saying. We didn't have this contamination beforehand. FOX...to say one thing that has the appearance of truth while hiding a much larger deception. REHMSteve Everley, I want to ask you about something else, and that is the industry's recruitment of former military PSYOPS. Explain what that is, please. EVERLEYWell, I think the industry has a lot to brag about in terms of hiring veterans and actually being very proud about hiring people with a variety of different skills. I know that segment. I've seen the movie. I know that there is this whole hysteria now about, oh, PSYOPS, and they're training these people to go in. There's probably black helicopters in one version of the story. EVERLEYThis is all, you know, Mr. Fox just said, you know this is deception. This is half-truth. That's a video clip taken out of context of a broader conference talking about hiring veterans. And was it an inartful comment? Yes. But our people -- our company is actually hiring people to train, you know, go after populations with psychological warfare. It's an absurd statement. EVERLEYBut you know, I think if we step back from this just a little bit, what we see here with "Gasland" and with "Gasland Part II" is part of a broader problem, that you have critics of hydraulic fracturing levying a whole host of accusations and claims, and they're never asked to account for them. The industry is forced to respond to them. EVERLEYAnd there are a variety of questions that have been raised from "Gasland" and "Gasland Part II" that should have been brought to the attention of Mr. Fox and other people who oppose fracking. But instead, their claims are just, you know, they're just thrown out there, and it's without any scrutiny. And they get reprinted all over the place. EVERLEY(unintelligible) this idea of water contamination, of fear and everything else around that. REHMOK. Steve, go back to the military PSYOPS question, would you, because I know you've referred to veterans, and we all support the hiring of veterans. But specifically, what are those veterans tasked with? EVERLEY...this isn't anything that's atypical that people will hire veterans. And I think it's something that the industry should be very proud of, and they are. FOXWell, Steve, you know that all of the things that you just said about what we're reporting on in "Gasland Part II" are obfuscations or outright untruth. These are clips. They we're audio clips that were taken, recorded by reporters in a gas and oil conference in Texas in which Matt Pitzarella of Range Resources brags about hiring former PSYOPS, psychological operations officers who were deployed previously in Iraq and Afghanistan to use against land owners in Pennsylvania. It is illegal for the military to use PSYOPS techniques in the United States. FOXWell, these are psychological operations that has to do with winning the hearts and minds, creating a single narrative, doing all sorts of things to split the community psychologically. FOXWell, another thing that the oil and gas industry representative, one from Anadarko and another one from Chesapeake, said that the gas industry should do is to read the counterinsurgency manual. And they described land owners in Pennsylvania who were fighting the gas industry for their, say, public health and safety as insurgents. These are terms of war, and they were -- this was the gas industry doing a conference on their own PR strategy in terms of how to respond to land owners who were trying to fight them off. REHMAll right. Steve Everley, respond to that, if you would, please, because I did watched the entire film yesterday. I did see that conference and hear those quotes. How do you respond? EVERLEY...into this huge implication and this huge indictment of the entire industry because we have this one little thing here and this one little clip here and this one guy said this one inartful comment over here. You know, if the industry's going to respond to things, we're going to respond to things, you know, in due course. But let's actually have an honest conversation here about what this actually doing. EVERLEYAnd as I said earlier, why don't the people who are opposed to hydraulic fracturing, the people who are opposed to shale gas, why aren't they held to account for some of their claims? Why don't they have to answer the question of -- for instance, they say they support, you know, reductions in carbon dioxide, but it's natural gas that's brought those levels down to 20-year low. EVERLEYThey say they want to reduce our reliance on foreign energy, and yet it's shale oil and shale gas that actually is reducing our reliance on OPEC. They said they want to create jobs. Tens or even hundreds of thousands of jobs are being created by shale development across the country in areas that have never seen that kind of development before. EVERLEY...every claim they make and why it's true and why they disagree with state regulators. REHMAll right. And Josh Fox is here right now, and I want him to account for the statements. FOXI have no idea which things that you had said to respond to, but what I will say is this was from an inartful comment. This was the chief spokesperson for a major operator working in Texas and in Pennsylvania, and those -- that's simply holding them to account for their own words. As far as all the other things that you've said, we're talking about a drilling campaign that has been incredibly destructive. FOXAnd the reporting is in line with that, not only in Pulitzer Prize-winning publications like ProPublica that's run -- that have run nearly 100 articles on fracking, but in The New York Times. These things have been widely reported. The Pennsylvania Department of Environmental Protection has already confirmed out of 1,000 complaints from the citizens 160 water contamination cases. FOXAnd yet this industry continues to come out and say there's never been a single case of water contamination due to hydraulic fracturing. Again, another sleight of hand, as it turns out, and we find out from reporting and on the gas industry's own documents the drilling itself is failing. So when the gas industry says, oh, it's not the fracking, there's this, again, this manipulation, this sleight of hand. The drilling contaminates the water. REHMJosh, I want to ask you about the conference from which you took those quotes about PSYOPS. How long were you recording? FOXI wasn't there personally. This was an amazing blogger who works for Earthworks named Texas Sharon. She recorded, I think, the whole two days' worth of conference, and this was a specific section of the meeting to deal with all of the bad PR that the gas industry was getting and how they were going to counterattack. FOXWe saw slides that said you have to go aggressively into those communities, hold meetings every single night. They were in the business of trying to win over hearts and minds, as I said. And there were examples that were brought up of some very aggressive letters that were sent to landowners in Western Pennsylvania with a deliberate, kind of very threatening tone. FOXWell, there's been a lot of reports of land men going out there with willfully deceptive tactics, and I can speak to this myself. As a landowner, when they come to you and they say, you'll never know we're here, and we probably won't even drill, or these are safe techniques, and then all of a sudden what you're in the middle of is an industrial development with hundreds of well pads being planted all around you, flare stacks, waste pits, problems with the wells where they're leaking in underground aquifers, truck trips by the thousands to every single well pad. These things are very well known. REHMSteve, there are a great many people shown in this film and in the first "Gasland" who do seem extremely concerned about the results of fracking on their land, people who are suffering nosebleeds, people who are very, very sick and claim at least that they have become sick as a result of the fracking. How do you deal with those complaints? How do the companies who are fracking deal with those complaints? EVERLEYWell, let me just say, you know, to start off here, if people have concerns and people have questions or any kind of, you know, issues that they think are going to come up with development, that's a perfectly fair thing to have. I mean, it's perfectly legitimate to have concerns, to have, you know, certain worries or anxieties about what this is going to do to the land. But let's actually have an honest conversation about what it is and what it is going to do. EVERLEYAnd then after development starts, let's have an honest conversation about what was and what was not the source. You know, it's easy for someone to go out there and just say, oh, fracking. That sounds like a bad word. Let's blame that. But what if that's not actually the cause? Yes, maybe there is an oil and gas development nearby. But what if there's actually some other cause for some of these impacts? EVERLEYIt's OK to have concerns. That's perfectly legitimate. REHMSteve, may I -- please, Steve, may I please? Has your organization or any organization talked directly with landowners who've sold their homes because the drinking water is no longer drinkable? EVERLEYI'm sorry. Was that for me, Diane? I apologize. REHMYeah, I started out with Steve. Yes, it was for you. REHMAll right. Hold on, Steve. OK, Josh, your turn. FOXWell, Steve, you're glossing over the fact that what we're talking about here are well sites where volatile organic compounds, BTEX chemicals and other harmful things vent off these well sites right next to people's homes, and this is happening across America. Their health effects are explainable by those chemicals being in the environment. FOXThe Colorado School of Public Health did an initial public health assessment in Garfield County, where there are 8,000 gas wells right at the headwaters of the Colorado River, and they found a number of categories in which health effects would be present in moderate to severe forms. And these are all sorts of different kinds of ailments. FOXBut moving on to what you're saying about this being a boon, we're talking about a drilling campaign in which multinational oil companies are coming forward and abusing people's human rights. We're trying to have an honest conversation about how that plays out across the United States of America, and the bottom line here is we can't trade our human rights or our civil rights for a buck. FOXThat is just not something we want to do in the United States of America. We're talking about the oil and gas industry having control over and having leased a land mass that is equivalent to the entire land mass of California and Florida combined. When we look at this, it's not, as you say, about managing or mitigating risks. We know the probabilities. The oil and gas industry reports that 5 percent of the wells will fail immediately upon drilling, and 30 percent of the -- 50 percent of those wells will fail in a 30-year period. REHMAll right. And when we come back, we're going to talk about earthquakes. We're going to talk about other impacts of fracking. Steve Everley, thanks so much for joining us. He's a spokesperson for Energy in Depth. REHMAnd if you've just joined us: Josh Fox, the creator of the first "Gasland" film and now "Gasland II," which is being shown on HBO this week. Josh, quickly tell me about the reaction you got to the showing last night. FOXWell, it was just last night, and it was on television. But Twitter kind of exploded, and we were re-tweeting and tweeting back to people. The whole record of that, I'm sure, is out there. And also on our Facebook page, the conversation was incredible. And it's amazing to watch a film that you've worked on for three years all of sudden get broadcasted into 40 million homes. It's extremely gratifying. REHMAll right. And now joining us by phone from ProPublica in San Francisco is Abrahm Lustgarten. Good morning to you. REHMAbrahm, I know you recently wrote about a surprise decision by EPA to retreat on a multimillion dollar investigation into water contamination in a Central Wyoming natural gas field last month. What happened and why? LUSTGARTENWell, I think, the central question in this conversation is about, you know, what we know and what we don't know and whether there is enough scientific evidence to draw any conclusions about the risks of these drilling processes in general. And in Pavillion, Wyo., beginning in 2008, after 10 years of residents complaining that they had problems in their water and other sort of alleged contamination, the EPA began a scientific investigation into the quality of the water locally and what might have caused contamination if they found contamination. LUSTGARTENAnd at the time, this was a very aggressive inquiry and one of the most detailed inquiries. And the EPA found extensive contamination across a number of residential water wells. They found trace levels of toxins that can be linked to hydraulic fracturing fluids. They can also be used in other substances. But there was a tentative link. LUSTGARTENAnd they proceeded from there with several additional rounds of testing and drilled a couple of deep monitoring wells and in 2012 or late 2011, issued a report that said that they were connecting the process of hydraulic fracturing with the groundwater contamination that they had found in Pavillion, Wyo. That was a highly contested report. We could debate the merits. There appear to be some problems with the scientific processes. LUSTGARTENBut the end result is that just recently the EPA completely dropped that investigation without ever verifying its results, without going through what they call a peer-review process to get feedback about their results. And they're turning the investigation over to the state of Wyoming. The state of Wyoming will use funding -- $1.5 million dollars from Encana, which is a company that owns or owns the wells in question to fund a new line of research starting again to determine whether or not there's contamination in Pavillion, Wyo. REHMOK. Let me be clear about this. You're saying that companies who are doing the drilling have been asked to do the scientific investigation as well. LUSTGARTENWell, not exactly. The company is providing the funding that the state will use to conduct the scientific investigation. REHMOK. So where does this lead, the EPA's remaining research into the effects of fracking? LUSTGARTENWell, the EPA now is resting solely on a long-term national study that it is conducting into the relationship between water and hydraulic fracturing. They have promised a draft by late 2014 and say that they won't finalize the study until sometime in 2016 optimistically. There's a lot of promise for that study. People are still optimistic about what kind of information will come from it. LUSTGARTENBut the bottom line is that, you know, a couple of years ago, the EPA had taken a stance of doing everything it could to investigate complaints about environmental concerns in a multifaceted, multidirectional way, ranging from its air programs to its water programs to its superfund programs. And it launched a number of investigations responsive to citizens' complaints. And at this point, each of those has been cancelled or ended one way or another. And the only remaining aspect of EPA's engagement on this issue is this long-planned national study. REHMHas -- in your writing, in your research, have you found any evidence of industry pressure on these lawmakers? LUSTGARTENWell, sure. It's largely anecdotal, but it's everywhere. You know, what you find is industry -- the oil and gas industry as well as the rest of the energy industries, you know, our major donors to political campaigns, the pressure comes from the recipients of those donations to the EPA, to President Obama's administration and to other federal agencies that address these issues in various ways. LUSTGARTENOne example is what Sen. James Inhofe has done in response to the EPA's investigations in Pavillion and in Parker County, Texas. Sen. Inhofe was involved early on in kind of pestering the EPA, asking for extraordinary details about the EPA's scientific approach, about their study, checking how many, you know, whether it was $57 or $150 that the EPA is going to pay for a certain type of water analysis and so forth. LUSTGARTENAnd that kind of pressure and scrutiny, you know, is one of the things that EPA scientists tell me, you know, really kind of just hampers, weighs down and drags on their investigations. Sen. Inhofe's largest campaign donation over his career has come from the oil and gas industry. That's just one kind of example of the influences that I see. REHMAll right. And, Josh Fox, you -- in "Gasland II," you talked about former Pennsylvania Gov. Ed Rendell. FOXWell, this is actually the whole thesis and the whole story in "Gasland II," is watching at every level -- the state level, the local level and then finally, the federal level -- the regulatory agencies succumb to pressure by the oil and gas industry. And in many ways, this is coming from a lot of different angles. FOXWe know that Pennsylvania -- former Pennsylvania Gov. Ed Rendell, who's an advocate for natural gas, who is actually in the conflict of interest being an advocate for natural gas because he goes out and he advocates for drilling without disclosing his industry ties, went to EPA at around the time of one of these investigations -- the investigation in Texas involving Range Resources -- and actually petitioned Lisa Jackson and the EPA to drop the investigation. FOXAnd he went in acting on behalf of the gas industry, on behalf of the company in question. In Pennsylvania, the Public Accountability Initiative data report called Fracking and the Revolving Door in which they show the ways in which at every level of DEP, from the head of DEP, the Department of Environmental Protection, to the governors of Pennsylvania, you have a deep influence of oil and gas offering lucrative positions to regulators who then switch sides. FOXAnd that report concluded that the amount of this influence of oil and gas had actually taken the regulatory agency away from the citizens and that it had a corrupting effect. So the agencies themselves no longer serve the public. And this is the story that we see played out in the film at the state level. FOXThe state of Wyoming, which has now been handed this investigation, was openly hostile to the EPA from the get-go, saying that they didn't want the EPA in their state, and now all of a sudden, they're in charge with this huge contribution, $1.5 million from the drilling companies itself being investigated. And finally, we watch as EPA folds when the policy changes. FOXAfter that speech by President Obama, we watched the agencies just start to completely scale back as Abrahm mentioned. I did have a conversation with a former EPA administrator about this, and he said, well, when you see a big speech like that by the president, agencies tend to fall in line. And that's the story that we're telling. We're watching as, you know, the first "Gasland" movie is really about watching people light their water on fire. This film is about watching the oil and gas industry light our democracy on fire. REHMAll right. Let's open the phones. Abrahm, can you stay with us? REHMOK. First to Fowlerville, Mich. Good morning, Terry. TERRYHow are you, Diane? Good show as usual. TERRYYeah, I just wanted to comment. I worked at the oil fields in my youth down in Texas and Oklahoma, and I rubbed elbows with Halliburton, Anadarko, Parker, all of them, Cameron Iron Works. And we did BOP, blowout preventers. And it was common that -- you know, it's not fracking. It's not fracking. All right? They're just going for the natural gas. But, you know, I mean, I've had blowout rigs where I'm working with (word?) too. And there was times where my lead off had to shave his beard in the case of H2S gas escaping. TERRYAnd they told us that right up front before we got on the location, that he had to shave his beard right there on the spot because the mask would not seal on his face with the beard. And there were other, you know, parts of this industry that, you know, contaminated certainly the wells that he's talking about, with the pools, all right, where they, you know, they have to do all this conversation that Josh is doing. The industry, corporate America, wouldn't even be talking about this if it weren't for Josh's work and people like him. REHMI think you're absolutely right. You have clearly raised issues that people have been concerned about but don't know what to do. FOXWell, I thank you so much for the comment. And it's from the workers, in many cases, that we're getting our information from. They're saying, go over here and talk about that. But honestly, I think Abrahm's work, what's happening in The New York Times, what's happening on the airwaves and on television is a result of this huge drilling campaign. FOXIt's not about any one filmmaker. It's about the fact that millions of people are affected, and they're starting to speak out. REHMLet's go to Royal Oak, Mich. Hi there, Brian. BRIANMy concern would be if there was a major contamination of a watershed from a large metropolitan area. Like, they spoke of New York. Is there money put in escrow? I mean, what would be happening? Is there plans? Like, how would people get by or survive? REHMAbrahm, do you have anything on that? LUSTGARTENYeah. Different states hold different amounts of money in what the caller describes as escrow in, you know, as part of the drilling permitting process. And this happened across the natural resource industries. What we typically see is that that money is nowhere near what's required if it turns out that there's some sort of major environmental problem that's going to require a long-term cleanup. So there's money set aside, but it's rarely enough. And often, if there's a large problem, those cleanups fall on the states, on state governments or, ultimately, on the taxpayer to cleanup. REHMJosh, I want to ask you about the mayor of the town of Dish. Tell us about him. FOXWell, Mayor Calvin Tillman is the mayor of a small town called Dish. They renamed the town Dish to get 10 free years of Dish Network. He's in the first film, and his story is even more compelling in the second film. He's forced to move by his own family's health concerns. In the Barnett Shale in Texas, there are about 15,000 gas wells. One family, the Parr family, is surrounded by 21 wells. Lisa Parr reports that she has fracking chemicals in her lungs. FOXShe is sick. Her daughter is sick. Her husband is sick. They have to evacuate their home. And Calvin Tillman installed air monitors in Dish, Texas, and came back with a whole host of airborne chemicals both that in one hour exposure rates and chronic exposure rates could have negative health effects. Those were benzene and other compounds that were in the air. He knew they were there. He decided to move his family out of the town that he was actually the mayor of. REHMAnd you're listening to "The Diane Rehm Show." Let's go to South Bend, Ind. Hi there, Chad. CHADHello, Diane. Thank you so much for bringing this conversation to NPR. CHADMy original -- my question was originally for Steve, but it sounds like he's not there anymore. I want to get away from the primary argument that's going on right now and ask more a simple question. I heard you a little bit earlier, the fact that these wells required millions of gallons of fresh water that is -- that the chemicals are put into. Isn't this enough of a concern for us that they're using a far more precious resource, our limited freshwater supply, for this kind of purpose? FOXExactly. There are water wars going on right now in the West between farmers who are dying for water. And this is going to be a huge issue if they decide to go ahead and frack California. The water usage is huge, and a lot of this water is actually removed from the hydrological cycle. It's injected into the ground with the fracking chemicals. And once they turn the pressure valves off, a lot of that stays stuck in the formation. FOXAdditionally, the waste water that comes back up, which is in the millions of gallons, can be truck off to injection wells that is then re-injected into what they call these deep well injections. Abrahm just did an amazing article on how those injection wells are leaking. And then those injection wells, which contain lots of different chemical waste, in the fracking industry, that will be the volatile organics, the fracking chemicals themselves, the oil and gas that's coming up from the formation. FOXAll that material that's in the waste water, very, very hazardous, injected back down into the ground where it's supposed to be away from human life forever, just removed from the cycle. However, we're finding out that a lot of those injection wells are going into aquifers. They're leaking themselves, that they're very highly problematic in terms of contaminating groundwater. REHMAbrahm, what do we know about possible drilling near the San Andreas Fault? LUSTGARTENWell, you know, there's the Monterey Shale in California. It's not adjacent to the fault but is likely to be a very intense area of drilling development in the years to come. Actually, the closest drilling to the San Andreas Fault is geothermal energy production. What we have here north of San Francisco Bay Area and Sonoma County are a number of wells drilled and actually fractured similarly to a natural gas well to help circulate water through, you know, through the geothermal systems. LUSTGARTENAnd there is a lot of concern and regular implications of those wells and that system in causing some earthquakes. It's not clear yet whether there's a potential to trigger anything larger on the San Andreas or the other large faults, but that's something certainly scientists are looking at. REHMAnd, Josh, what about smaller earthquakes around the country? FOXWell, this came to my attention because there's 1,000 acre oil field right in the center of Los Angeles, that is on the Newport-Inglewood Fault, which is the fault that was responsible for an earthquake, I think, more than a decade ago, and the residents were very concerned that they were fracking on the fault line. I visited a town in Arkansas -- in Central Arkansas, where they had around 1,000 earthquakes in a year. FOXAnd those were ruled as a consequence of these injection wells, although citizens were also complaining that the fracking wells were triggering earthquakes. And this happened in England. The first two wells that were fracked there caused seismic activity. Now, most of these earthquakes are microquakes, very small, difficult to feel. But then a 4.7 hit in part of Arkansas that put cracks in the walls of the local high school, knocked people out of bed. And the concern is that we're causing man-made seismic activity through these drilling activities and injection wells. REHMJosh Fox, he's writer, director, producer of three feature films, including "Gasland" and "Gasland II," being shown this week and running through July 20 on HBO. And by phone, Abrahm Lustgarten of ProPublica. Thank you so much.